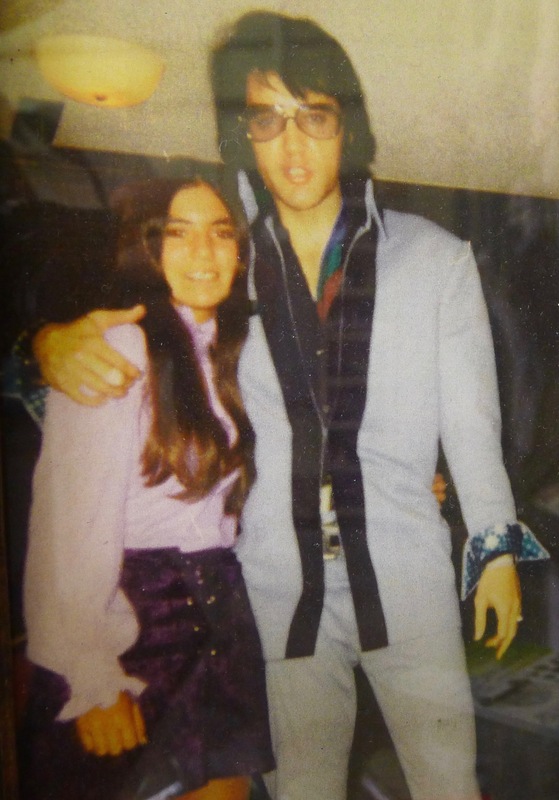 Abby Mays and Elvis Presley (1971). Photo of photo by Colleen Neff. 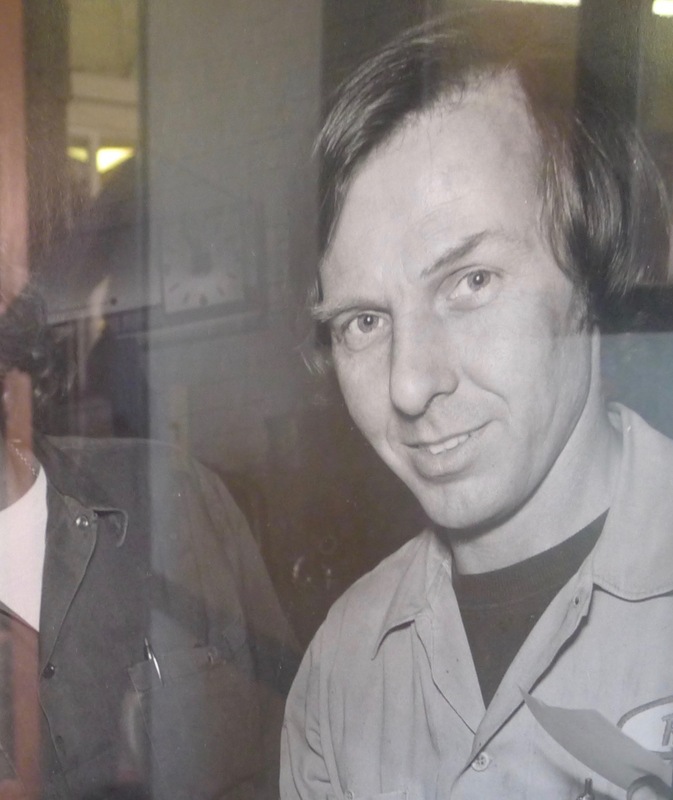 If this photograph were going to appear anywhere in a post, common sense dictates that it appear first, whether or not the connection with Berkeley were obvious. So – here it is, after that heavy dose of subjunctive. I was about to say “subjunctive tense” but that would be wrong. The subjunctive is a mood, a grammatical feature of verbs used for signaling modality, which is a term in linguistics describing expressions of how something might or should be – expressions of necessity, permissibility and probability, and negations thereof. Elvis appeared at the Sahara Tahoe for 28 shows starting on July 20, 1971. 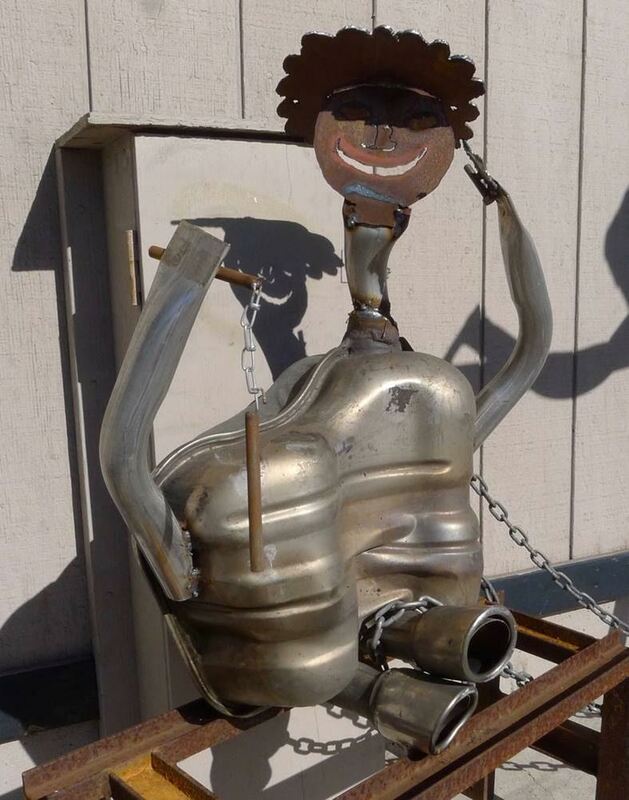 Ron Hulse is a big Elvis fan and is handy with metal. 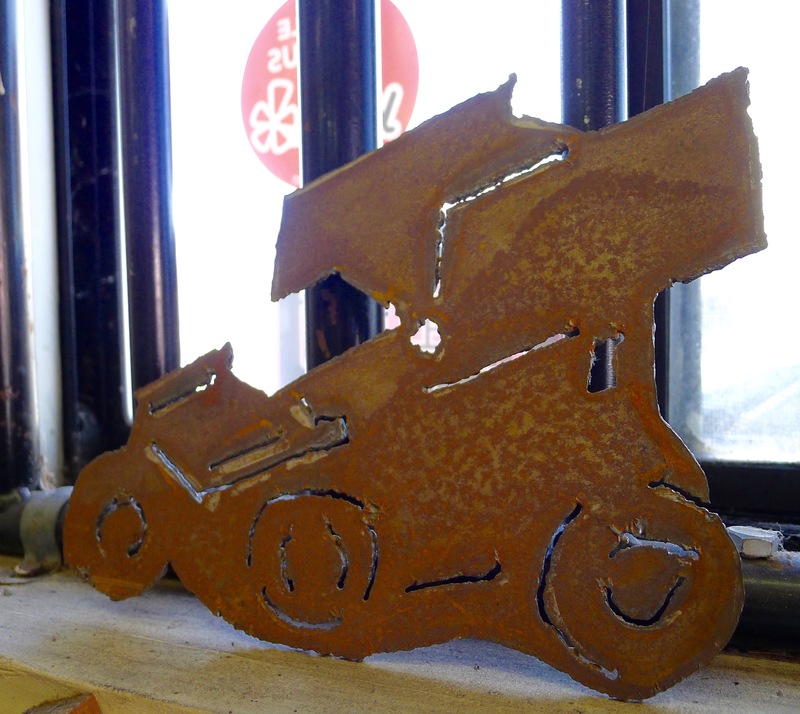 He made a motorcycle sculpture that he thought Elvis would like. He took his daughter Abby to the show at the Sahara. Through a little aggressive marketing, Ron and Abby were invited up to the Elvis suite. Elvis loved the gift. A perfect gentleman. Posed for this photo, apologizing for the bandaid on his right finger – a fan had tried to pull off his ring. 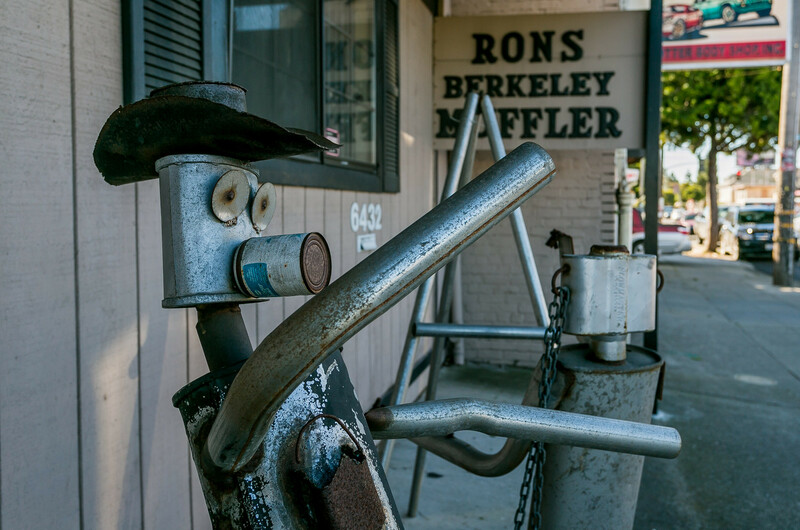 As for the “handy with metal” part – in 1962, Hulse and his wife Deanna opened Ron’s Berkeley Muffler at 2420 Shattuck Avenue. 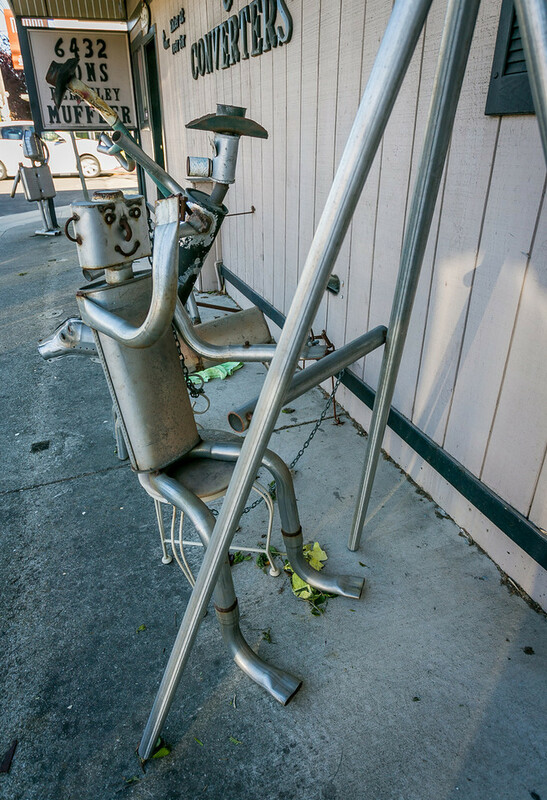 The location is now Giovanni’s Cafe. 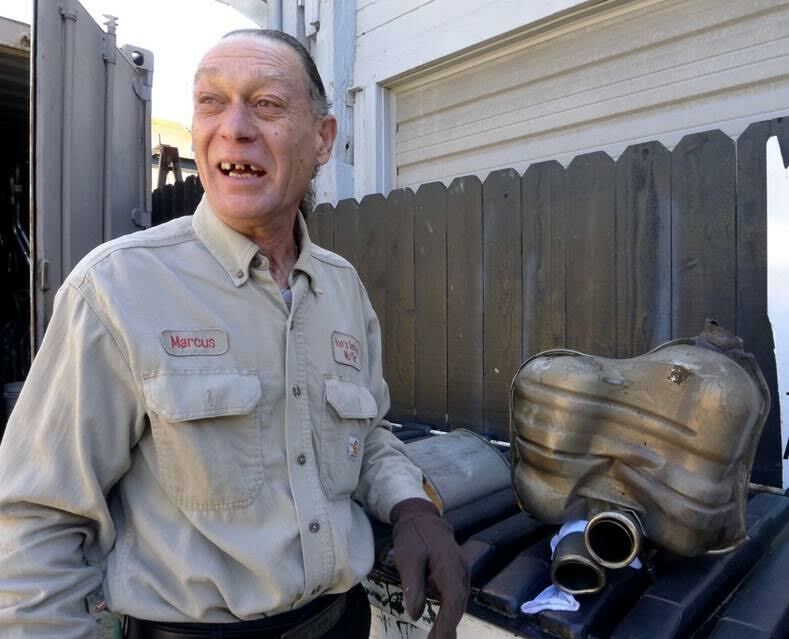 In 1989 he moved the business, one stop and then to 6432 Shattuck, “just inside Oakland” as the business card says. In other words – not in Berkeley. Despite the name. But this is, in my book, a big plus. 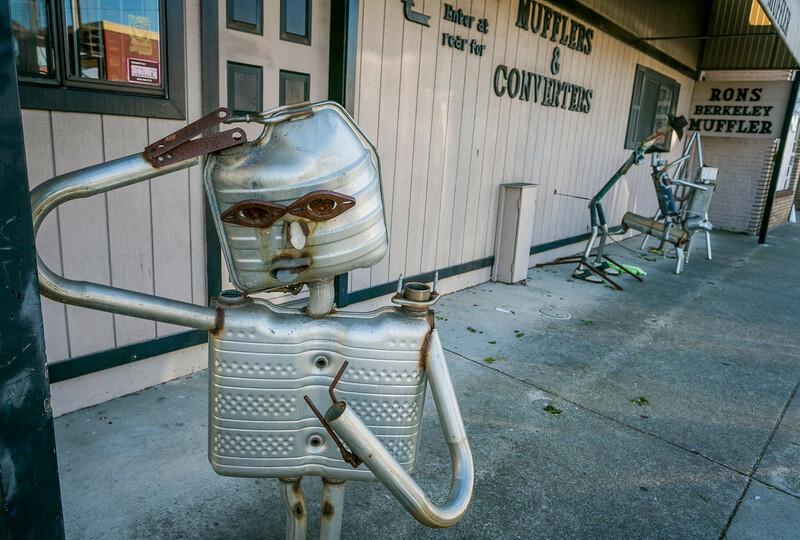 Muffler shops have a heritage of “muffler men,” figures constructed from discarded automobile mufflers. 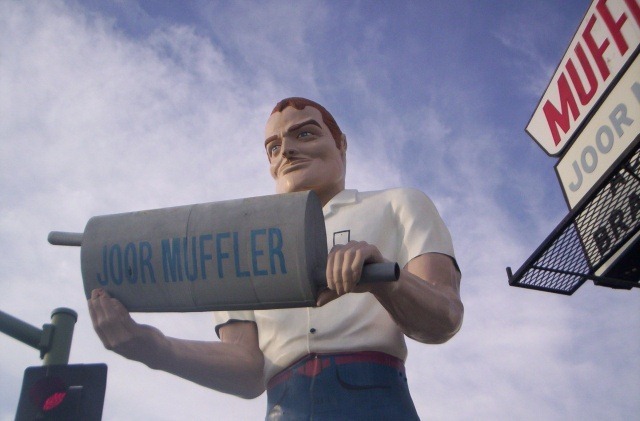 These are not to be confused with giant fiberglass statues, sometimes also called “muffler men,” especially by RoadsideAmerican.com. 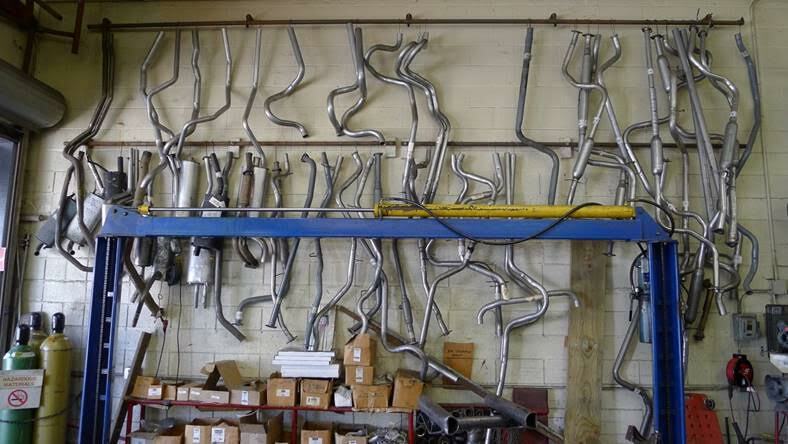 We are talking here about men made from mufflers. Timothy Corrigan Correll is a folklorist whose research focuses on material behavior and folk belief. 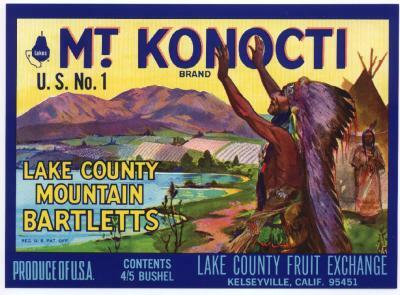 Patrick Arthur Polk serves as the museum scientist and archivist for the UCLA Folklore and Mythology Archives. 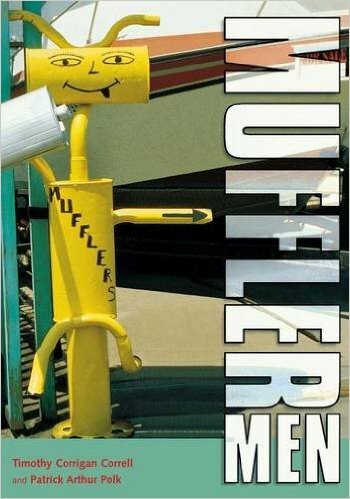 Their Muffler Men book rocks my boat. That’s it, at least out front. Decimated! 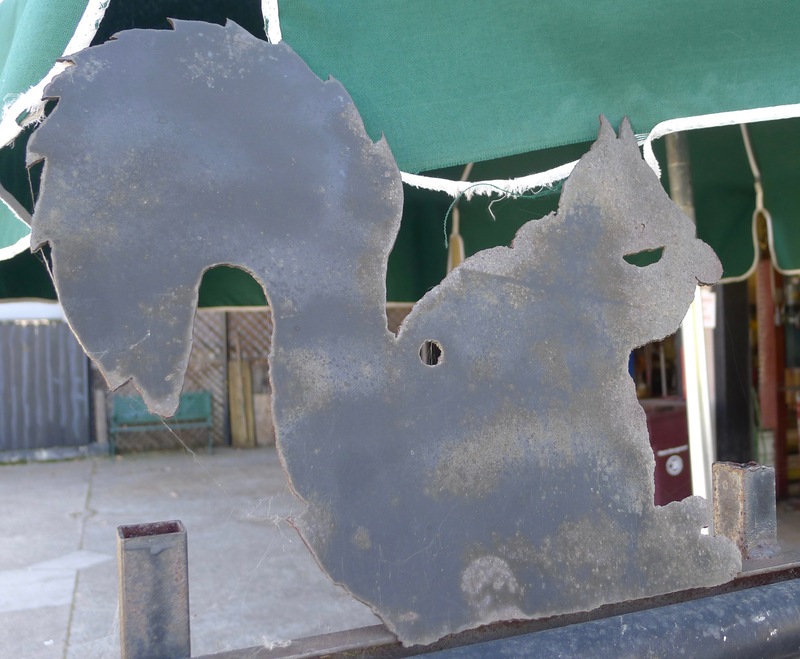 Looking at the shop, you can see where the idea comes from. 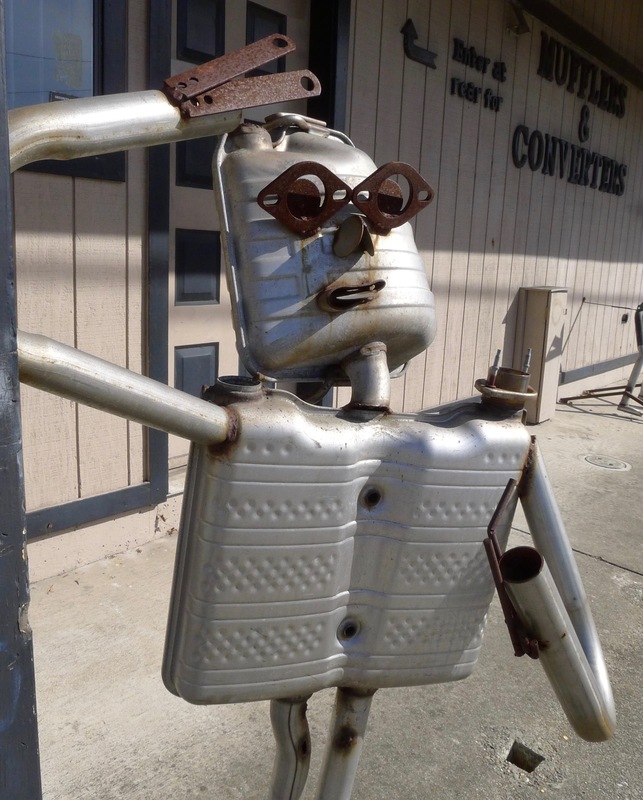 The materials lend themselves to sculpture, don’t they? 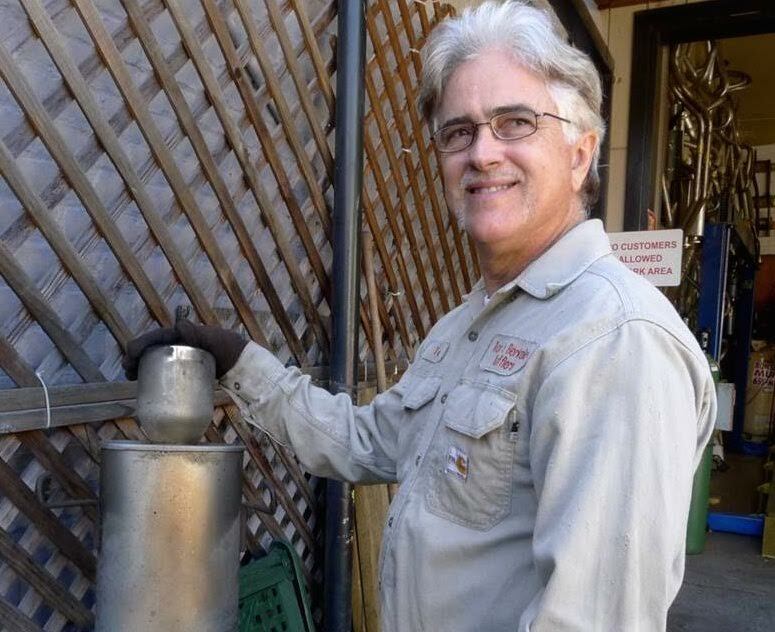 Hulse is retired, enjoying life in Danville. 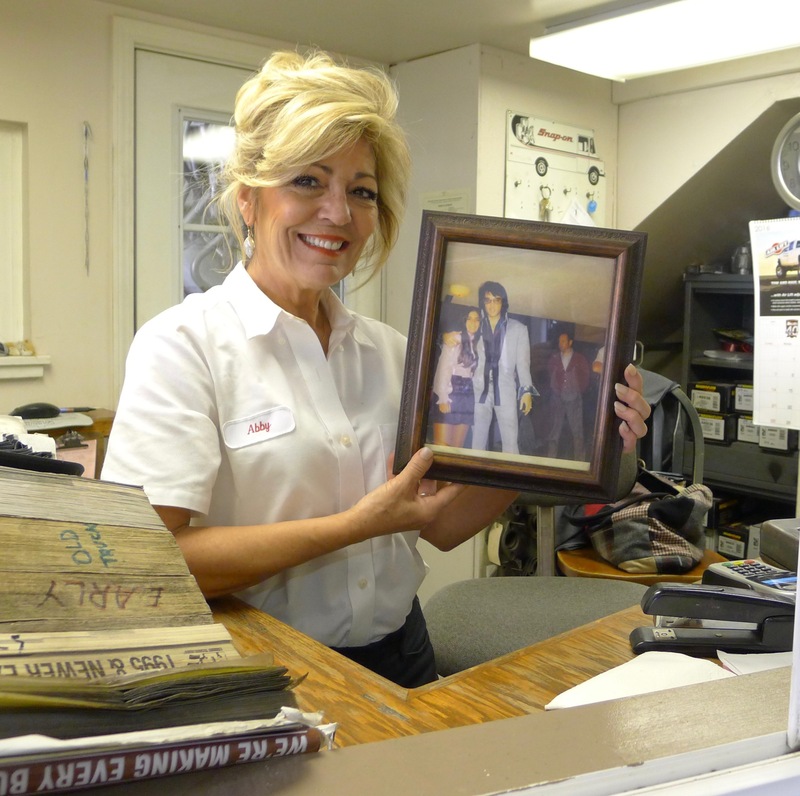 His daughter Abby Mays – pictured here and with Elvis – runs the shop today. Danville Dukes. Photo of photo by Colleen Neff. 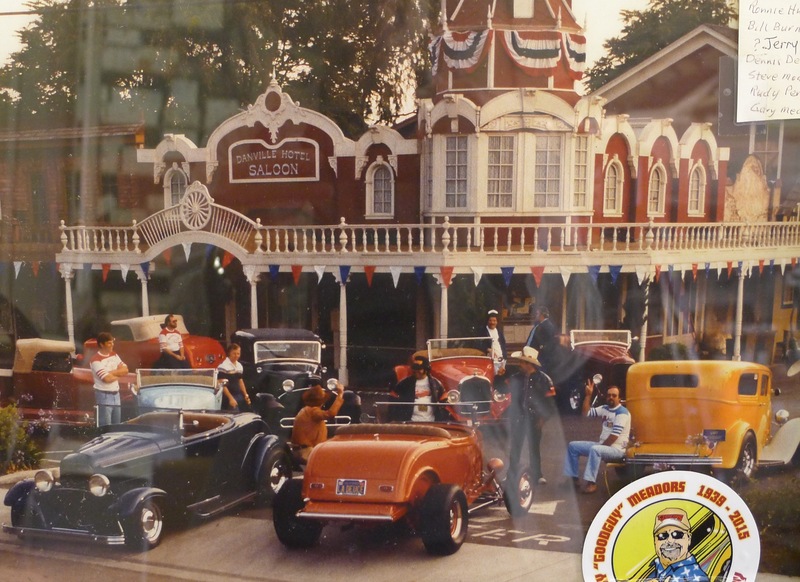 Mays is animated when describing her father’s love of midget and sprint car and NASCAR racing, the Danville Dukes (a group of hot rod enthusiasts), the Raiders, and Jimmy Reed, a Mississippi-born bluesman who died in Oakland in 1976 at the age of 50. 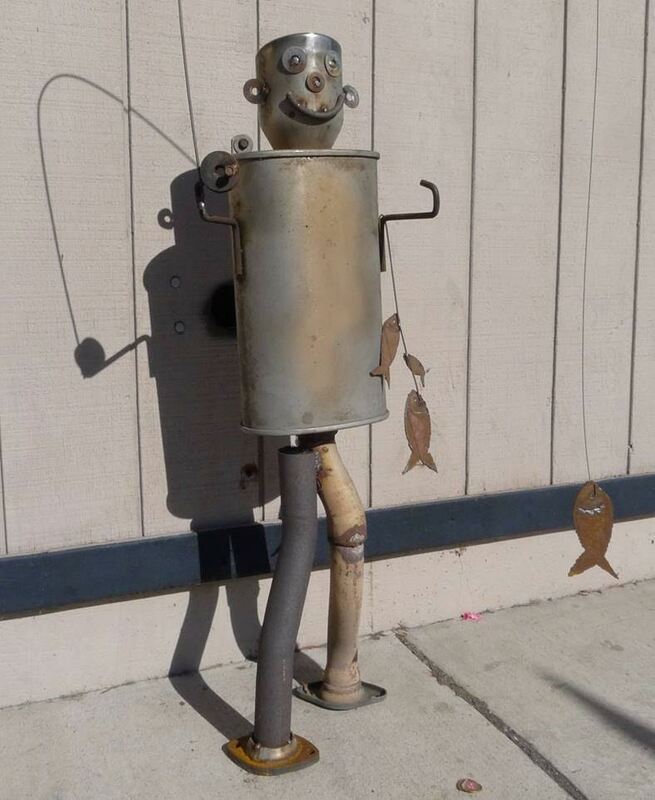 Mays is inspired by the interest in the muffler men. 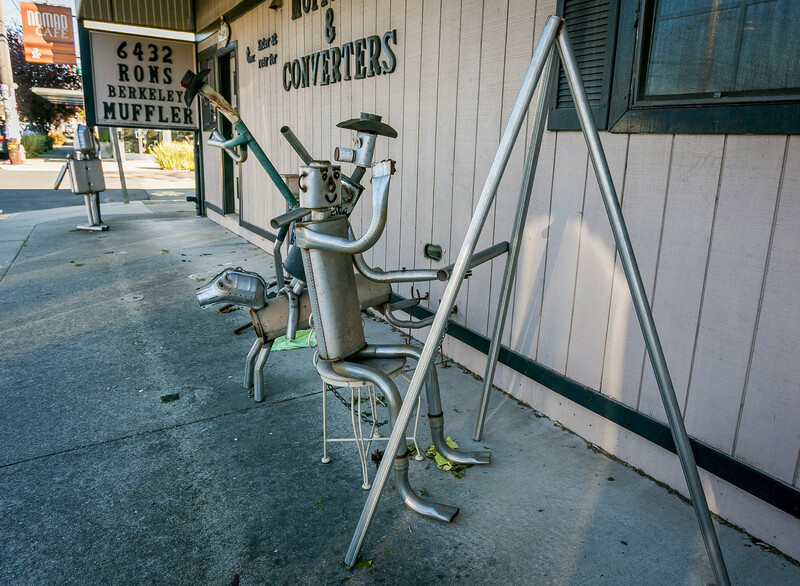 She has given the crew the green light to “get creative” with muffler sculpture during down time in the shop. 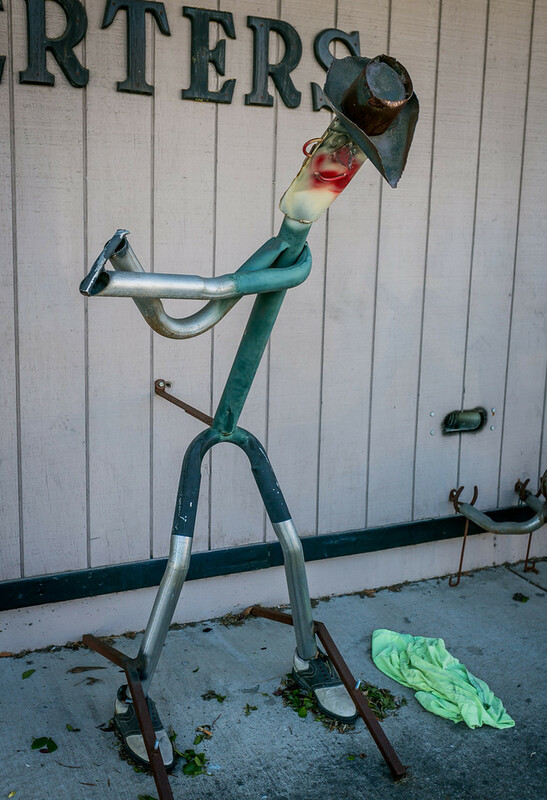 There are now two new sculptures out front! Ending as we started, there is another celebrity story and photo on the wall, besides Elvis. 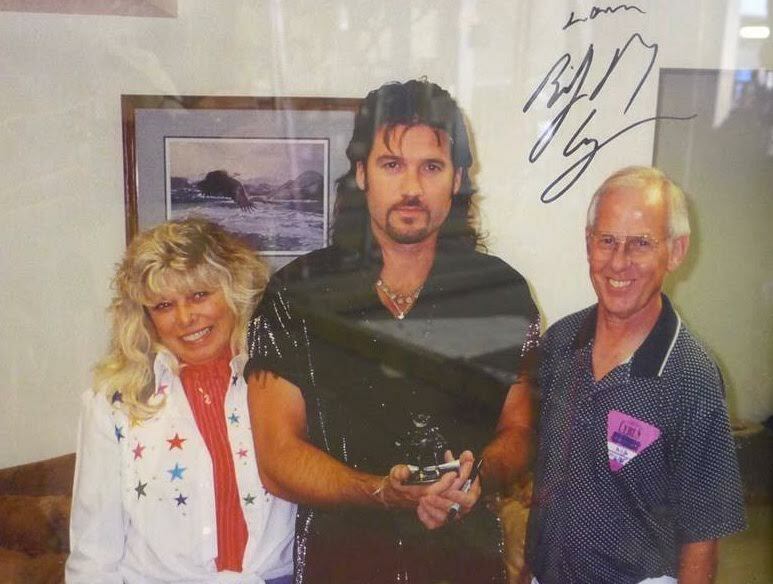 Hulse’s wife Deanne loved loved loved Billy Ray Cyrus, who was appearing at Konocti Harbor, a music venue and resort in Kelseyville, Lake County, founded in 1959 by Joseph Mazzola, president of plumbers Local 38. 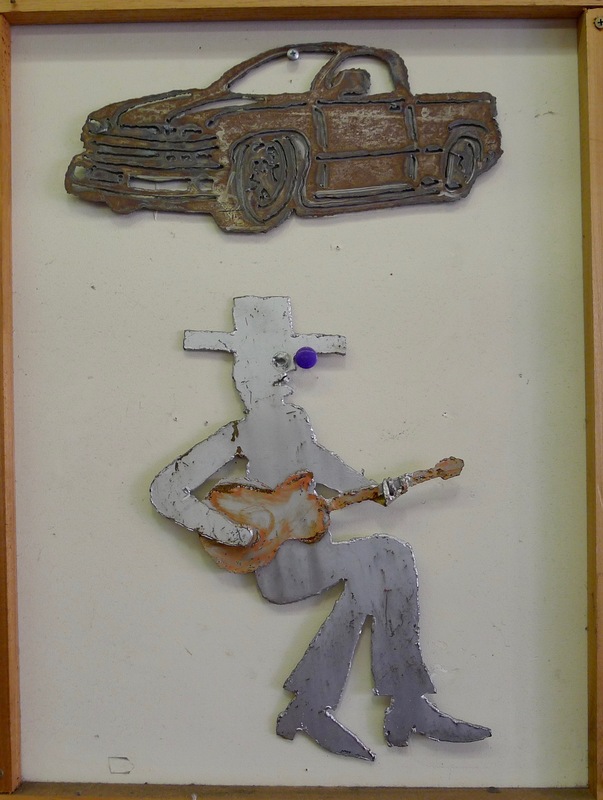 Hulse made a metal left-handed guitar player (Cyrus is left-handed) sitting in a chair, bronzed it, and etched in a replica of Cyrus’ autograph. Cyrus loved it, and asked for 60 more, unaware that it had taken hours and hours. Hulse had to say no. 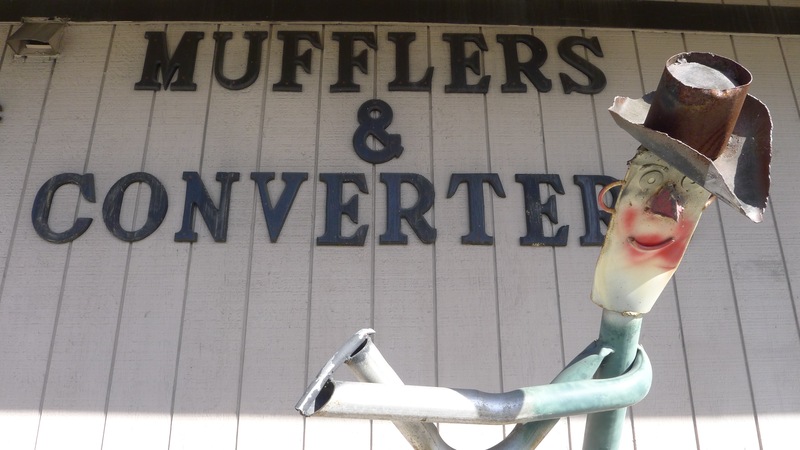 Whatever – what about the muffler men? 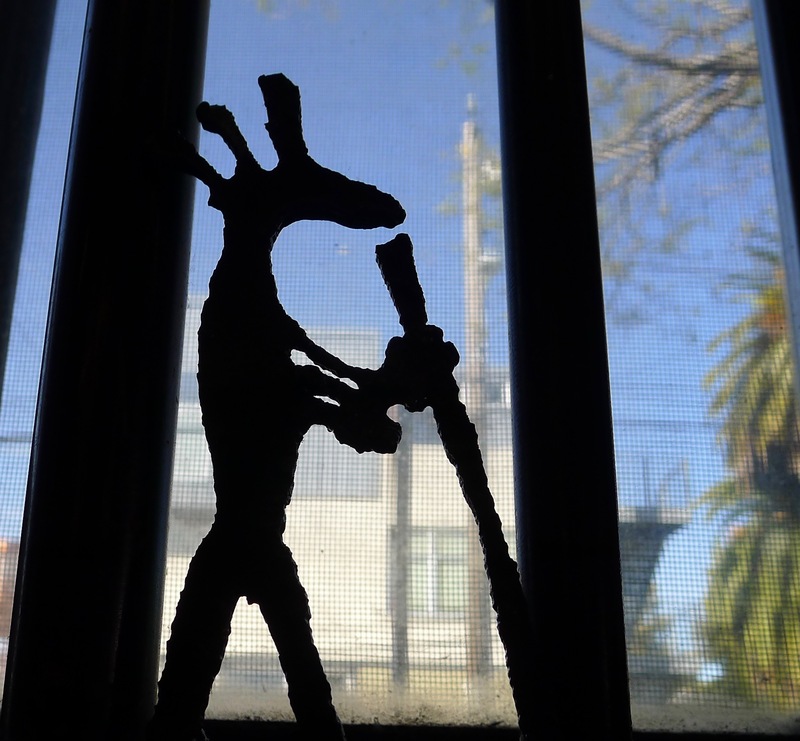 « Field Trip – San Jose – Ted Fullwood – WOW! 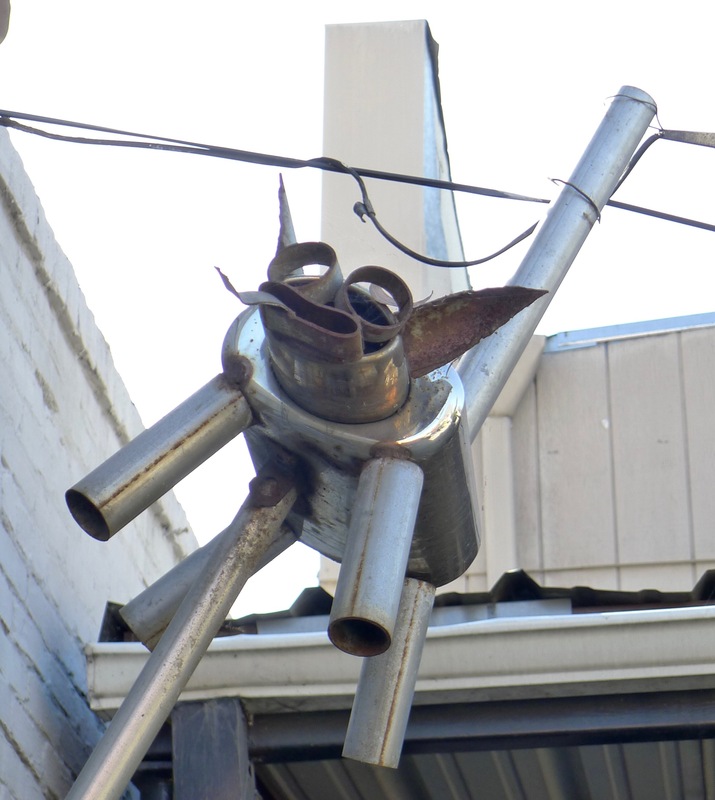 The Muffler Men are no longer the unsung heroes of the sculpture world because you Tom have opened up their song. 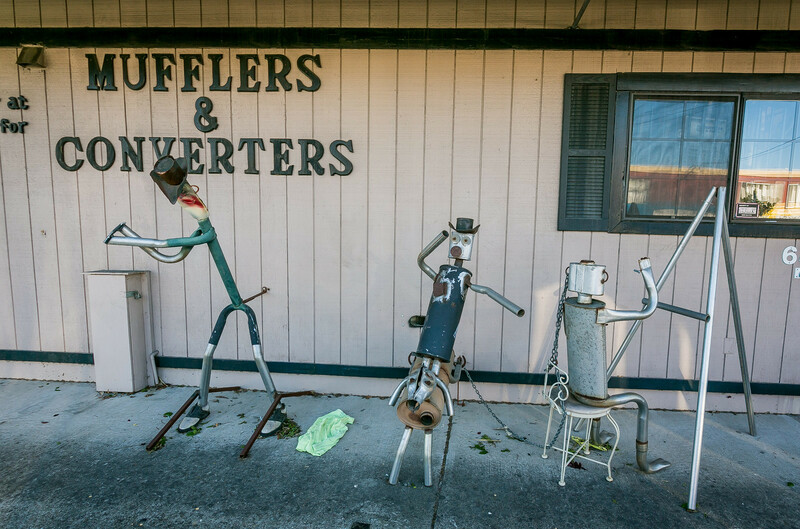 Love the muffler men. 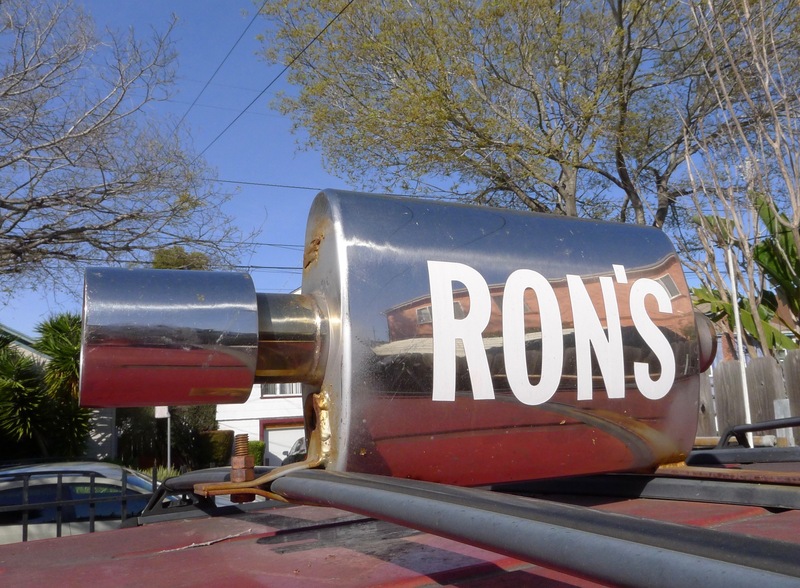 Love Ron’s shop. 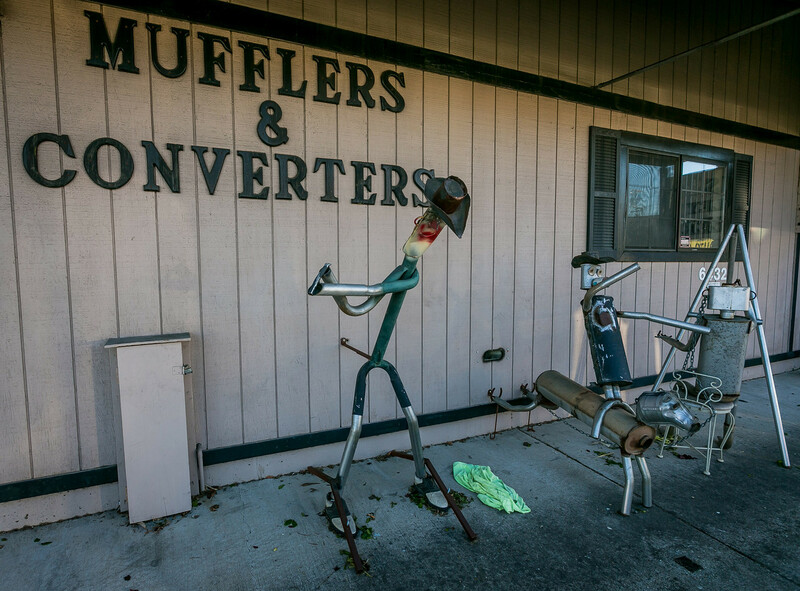 Am ashamed I never noticed the Muffler men in real life at the shop. Have to go back to see again! Thanks for doing these projects! Great!